Wolfgang Puck Pressure Oven: Does It Give Flavor Infused Cooking? Wolfgang Puck Pressure Oven review: Does It Give Flavor Infused Cooking? Using an oven often lets our food lose its original taste and we may not enjoy it as much as we wanted to. Most ovens are also very slow and can wear our impatient pangs. But nonetheless busy schedules or lazy days just need an oven to preheat our food and be on the move. There is a new oven you may want to invest in. The Wolfgang Puck Pressure Oven is an oven created by Wolfgang himself. This oven works using flavor infusion technology, to ensure your food does not lose its nutrients or dry up. The oven comes with automatic timer that makes it easy to monitor your food. The Wolfgang Puck Pressure Oven also works 70% faster. 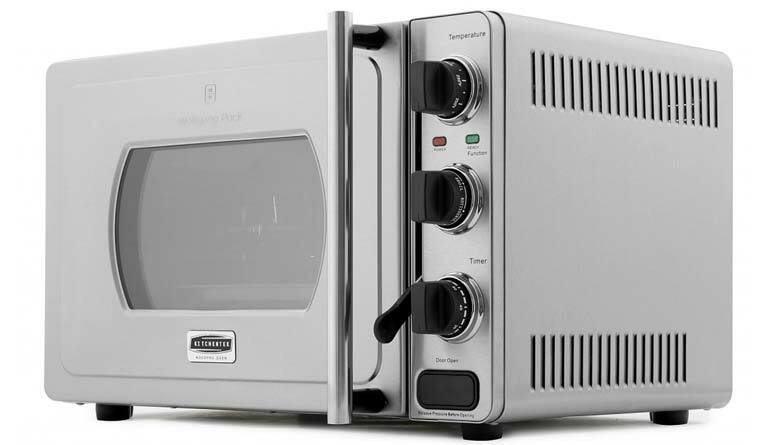 You can purchase the Wolfgang Puck Pressure Oven from their official website at $249 or for 5 payments of each $49.99 plus free shipping. There is a 60-day money back guarantee in case the oven does not impress you. One year warranty. Wolfgang Puck Pressure Oven was developed by Wolfgang himself. It is manufactured by Kitchentek. They promise that the puck oven can cook vegetables, soup, cookies and casseroles. The manufacturers claim that the Wolfgang Puck Pressure Oven not only cooks your food faster by a whopping 70%, it also makes your food more flavorful and juicier. The manufacturers package the Wolfgang Puck Pressure Oven with a baking rack, broiling rack, crumb tray, drip/baking pan and a roasting pan. They have also attached a quick guideline on how to use the oven and a recipe booklet to try out. How does Wolfgang Puck Pressure Oven work? A well-sealed chamber in the Puck Oven that prevents heat and moisture from getting out. Usually under low pressure. This helps concentrate all your flavors and enable fast cooking. Thus you do not lose any nutrients. To enable you monitor your food as it cooks. Small enough to enable it fit in kitchen cabinets. Large enough to cook large amounts of food. Built-in timer- to enable automatic shut-off. It doubles up as an oven and a pressure cooker. So you don’t have to buy them individually. Gives food better taste compared to other ovens. Cooks food 70% faster than most ovens. Does not eat up much space in your kitchen. Fit enough for a counter-top. Food does not dry up. Well sealed to retain moisture. Comes with an automatic timer so you don’t need to keep checking in. Has a window to enable you monitor your food. You do not have to open and disrupt the cooking. Gives a better complete cook. Uses up very little of your electric energy. It has a very competitive pricing; it’s a relief that you can purchase the oven on a 5 period breakdown with free shipping. Making it easier to purchase. Power on your oven to use. Choose the mode of use. There is a pressure mode chamber and another for the standard mode. Adjust to the style of cooking you want. Whether to bake, roast, toast, broil or warm. Put your food into the oven and close it. Also lower the sealing lever. Put the vent release valve in the seal position. Set the time you prefer to preheat. The puck oven will automatically go off. Power off the puck oven to save your energy. You do not have to worry about getting burnt with this oven as it comes with an automatic shut off and a window all designed to help you monitor your food. So you don’t have to keep pulling it out to check if it is ready. The Wolfgang Puck Pressure Oven is an oven worth purchasing if you are looking for a fast and effective performance. The oven has proven to be fast and cooks your food to a good taste. It is thus suitable for people with busy schedules who do not have the time laxityand are a fan of slow-cooked food. Besides its unique fast performance, Wolfgang Puck Pressure Oven is a combination of a pressure cooker and a countertop oven. It makes it cost effective and worth it as purchasing it is like buying two devices at once.